OIC Special Envoy to Myanmar Syed Hamid Albar says protests are necessary so the humanitarian conflict in Myanmar can be resolved. SHAH ALAM: Malaysians must continue to play a proactive role in protesting against the oppression of the Rohingya Muslims in Myanmar, says a senior official of the Organisation of Islamic Cooperation (OIC). 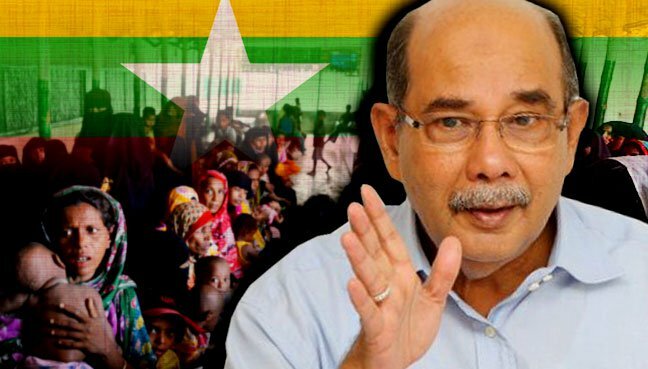 OIC Special Envoy to Myanmar, Syed Hamid Albar said this was necessary in order to urge the Myanmar government to give citizenship to the Rohingya and to act against those who spread hatred and incited violence against the minority ethnic group. “We want Myanmar to recognise the Rohingya as an ethnic group with rights and who were recognised as part of the country’s population by the first president of Myanmar. “Malaysia upholds human rights and does not want to see discrimination against any ethnic group and therefore needs to continue the fight on the cruelty against the Rohingya,” he said at the ‘Pray 4 Caring Ummah-Rohingya’ rally at Dataran Kemerdekaan Shah Alam, last night. Also present was vice-president of International Union of Muslim Scholars (IUMS), Abdul Hadi Awang. Syed Hamid said Malaysians should continue to fight for the rights of the Rohingya so that the humanitarian conflict in Myanmar could be resolved. “The Myanmar government is belittling a minority in the country. The Rohingya have been denied the right to citizenship, forcing hundreds of thousands to flee Myanmar. Meanwhile, Hadi described the oppression of the Rohingya in Myanmar as very disappointing for Muslims around the world. Hadi, who is also PAS president, said Malaysians must unite in addressing humanitarian issues in Myanmar. “The world community regardless of religion must cooperate. What is happening in Myanmar is wrong and contrary to humanity,” he added.